Illinois is a hopeless state, filled with greedy bureaucrats and senseless politicians. Not surprisingly, it’s also a state that prosecutes people who try to protect themselves from criminals. Here’s part of a story from the Chicago Tribune, featuring an elderly army veteran who was arrested for shooting a burglar. 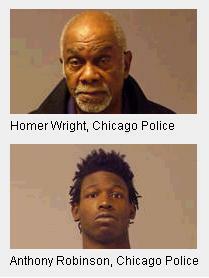 Fortunately, this isn’t like the Trayvon Martin case since both Mr. Wright and the thug are black. So without the distraction of race, we can focus on the genuine injustice of the government making it difficult for innocent people to fight back against crime. Mr. Wright’s family understands the real issue. Mr. Wright’s neighbors also have the right attitude. By the way, I’m mocking Illinois, but New York City is equally foolish about penalizing victims. And you will be flabbergasted by this example of anti-gun zealotry in England. It’s ironic, in an outrageous way, that the government punishes people for protecting their lives and property, when such actions are only necessary because the government is failing to fulfill one of its few legitimate responsibilities. This is why I recommend you share this Cato Institute study showing how private guns are frequently used to thwart criminals. P.S. I suspect these two anecdotes/stories are urban legends, but this interview with a general and this letter-to-the-editor are very much worth reading…and sharing. As my original post asked: Doesn’t the constitution give Mr. Wright the right to protect himself with a gun? You’re making the point that politicians have passed a law saying he can’t own a gun. But this just means that these law-makers have corrupted the law as well as the constitution. I’m now wondering exactly when this phrase was redefined to add “unless the politicians decide otherwise” in the USA? Is this expanded meaning of the original term in the dictionary? Could the support you demonstrate and give for such perversion of the English language be one big reason why such injustices happen? Think about this question, then please post your answer! The prior record of the burglar is irrelevant to the case against the store owner, though I hope the burglar’s prior record (if any) is taken into account as well. The burglar is responsible for the B&E, not the predicament that Mr. Wright is in for his own actions. It is a federal felony for a convicted felon to own or even handle a firearm. I don’t know how long this has been the case, but I would imagine at least since the NFA in 1934, if not then likely the GCA in 1968. The fact that felons cannot possess firearms without facing a five-year federal prison term is one of the things the NRA repeatedly points out in efforts to stave off additional gun control legislation. The man has every right to defend himself, just not every tool. That is a consequence of prior felonious behavior. Shooting someone in the leg is not evidence of responsible behavior or marksmanship, it is evidence that he missed center-mass by a couple of feet. Heck, I’m glad the burglar was shot and the store owner was unscathed, it’s unfortunate that his prior actions denied him legal access to firearms and that the crime of another exposed the crime of firearm ownership by the store owner. I am a strong advocate of 2A rights, but there are responsibilities that go with those rights, and if in the process of becoming a felon for a prior crime you prove yourself irresponsible with the rights you have, the government then has a responsibility to remove your rights for the safety of others. I hope the store owner’s years of peaceable conduct since his felony conviction are taken into account at sentencing, as well as his age, but he knowingly committed a crime by being a convicted felon with a gun and now it’s time for the responsibility for that action. Mr. Wright also shot the intruder only in the leg. That sounds like he used minimum force, a great libertarian principle, so where’s the problem? @Darren. How many prior felony convictions, or break-ins, does the intruder have? The police don’t protect him, yet you’re saying that Mr. Wright doesn’t have the right to protect himself. But doesn’t the constitution give him the right to protect himself with a gun? The intruder also needs to be named, always. Publicizing their name helps to alter their behavior. And also name the police official defending the corrupt law – is that Anthony Robinson? There’s a famous saying that’s relevant here – the government works best in the light of public scrutiny. Anyone know the source? Mr. Mitchell, the defendant has prior felony convictions that mean he is not legally entitled to own a firearm. That part of the state case is legitimate. He could have beaten the intruder with a bat or stabbed him with a knife, but a felon cannot purchase or even handle a firearm without committing federal and state crimes. Whether this is fair or reasonable is another debate. My wife and I are continually inspired through your ongoing commitment to excellence, fairness and professionalism in spite of the absurdities which surface daily in this country we hold so very dear. Stories like this barely get a yawn in Illinoistan. People who live there (like me) are so used to crazy stuff happening that they regard bad policy as the norm. I swear, some of these folks even embrace it in a bizarre “Stockholm Syndrome” way.